Corporate bonds and XTBs over them are securities and Term Deposits, or TDs are bank accounts. While different in many respects, they also have some key similarities making it relevant to compare and contrast them. Term Deposits may enjoy the benefit of protection under the Financial Claims Scheme. TDs are not tradable like shares, ETFs and XTBs, but they are fixed income investments. Like corporate bonds and XTBs, TDs have a fixed life and they provide regular income payments during that life, or alternatively at expiry. TDs and bonds are essentially loans from the investor to a bank or bond issuer. You lend money, it gets paid back, and you get interest along the way. Both TDs and bonds/XTBs belong in the defensive part of your investment or superannuation portfolio. They provide highly predictable and reliable returns compared with more risky growth assets such as shares and hybrids. If it comes to the unlikely event of a default by a bank – then TD holders will be paid out before that bank’s senior bond holders. Senior bond holders rank above equities, hybrids and subordinated debt, but below TDs. The bonds underpinning XTBs are held in a listed trust that benefits the XTB holders. So XTB holders are in the same position as bond holders when it comes to the order of payout following a default by the bond issuer. Rates for TDs have been falling throughout 2014, 2015 and 2016. TD rates are generally higher than government bond yields but lower than equivalent corporate bond yields. This is because the risk of lending money to the government is lower than the risk of lending it to a bank (when you invest in TDs). In turn, the risk of lending to a bank is lower than the risk of lending to a company. In theory yields are progressively higher when you move from government bonds, to TDs, to corporate bonds/XTBs. 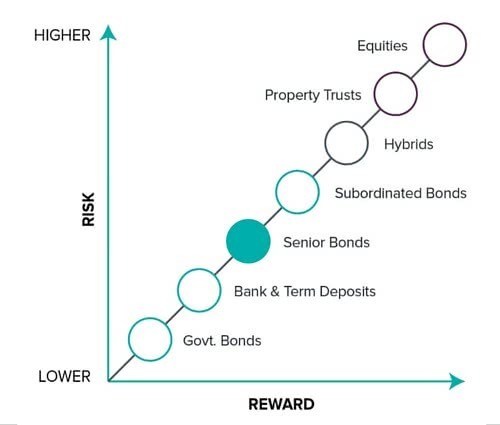 This is in keeping with the risk / reward chart that shows the more risk you take on, the greater the reward should be and vice versa. The current published TD rates for one of the four major Australian banks ranged from 1.5% for very short-term TDs to 3% for much longer-dated TDs1. How much is in Term Deposits? There is now over $810 billion in Australian household deposits. $160 billion of the total assets held by self-managed superannuation funds is in cash. It is held in cash management accounts (earning low 1s to 1.5%) as well as TDs. According to the major banks, 98% of TD money is held in short-term TDs. The most popular being 3 month and 6 month TDs. Their rates were quoted as 2.1% and 2.2% by the same major bank, if you wanted your interest at maturity1. This drops to 1.9% and 2% if you needed that interest monthly1. In comparison, investors can buy a high yield portfolio of XTBs on ASX with an average yield of 4.11%. The 48 XTBs on ASX currently range from 1.97% to 5.23%2. This demonstrates in practice, that bond/XTB yields should provide greater returns, for the added risk of lending money to a company rather than the bank. This difference becomes very relevant if you rely on the income from your investments to pay your bills and fund your cost of living. Let’s assume you shop around and find a smaller bank that offers you 2.85% for a 6 month TD1. Note, the smaller the bank, generally the more risky the bank itself will be. This is better than the 2.2% from the major bank, but a portfolio of XTBs yielding 4.11% provides a considerably higher return. The 1.26% greater return doesn’t sound like much. But on a relative basis it is 44% more. If your income from your investments was $50,000, then 46% more from a XTB portfolio provides over $70,000. TDs cannot be traded. If you want your money back early, you have to “break” the TD. When doing this there is a strong risk you might lose a significant portion, or all of your return (the interest). Part of the principal may also be at risk, depending on the break fee incurred. Since 2015, changes by global regulators have resulted in new rules – TDs can now only be broken with 31 days’ notice. This means you can’t access your cash for 31 days. The inability to sell your TD on a market like ASX is an unavoidable feature that comes with any bank account. A key benefit of securities traded on ASX is the ability to sell at a prevailing price and access your cash two days after you sell. ASX trades settle two days after you trade. The timing of accessing your capital is important when you need it. If you invested in a three-year TD but need your capital a year later, you risk losing some or all of your return by breaking it. With ASX traded securities like XTBs, you always have access, subject to liquidity (being able to buy and sell at a reasonable price). Two market makers provide buy and sell prices for XTBs on ASX. Market makers are banks and other trading companies that specialise in providing trading opportunities for investors on ASX in securities such as XTBs and ETFs. TDs and bonds or XTBs are different in many ways, but also share some common features. They all belong in the fixed income asset class sitting next to each other on the risk-return spectrum. Bonds and XTBs deliver an uplift in returns for the added risk of lending your money to an ASX100 company versus a bank. The uplift in returns can be significant on a relative basis, particularly for savers who rely on the income from their investments. 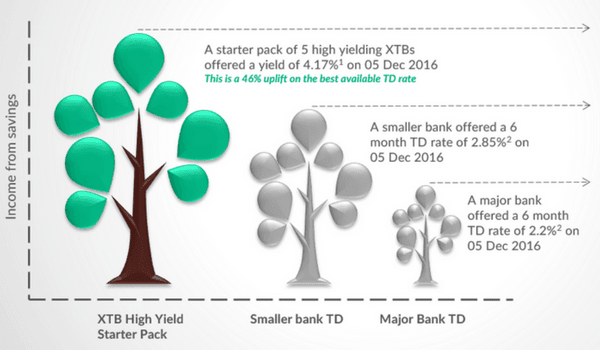 In the defensive part of your portfolio, it is worth considering the income advantage XTBs can provide alongside TDs.